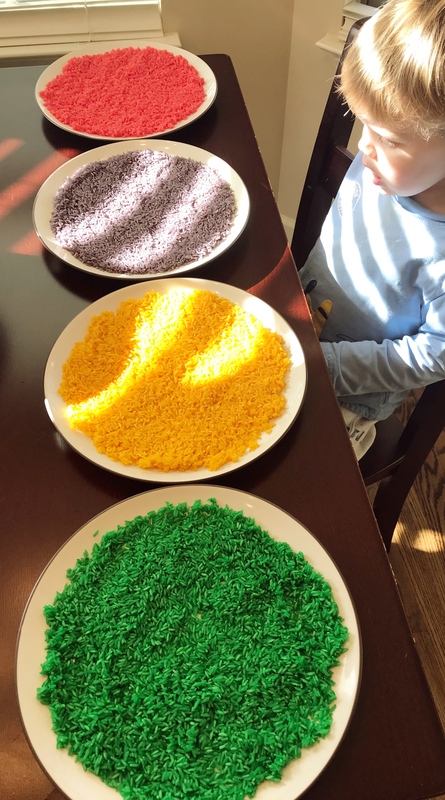 As a crafty challenged mom, I’m fairly new to sensory bins. But, I have good news. 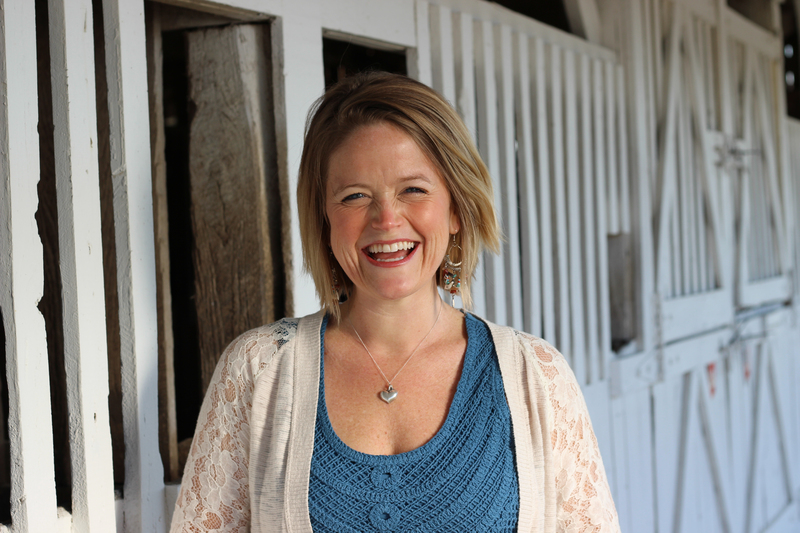 If you too are a craft challenged mom or just a busy mom (aren’t we all?!). 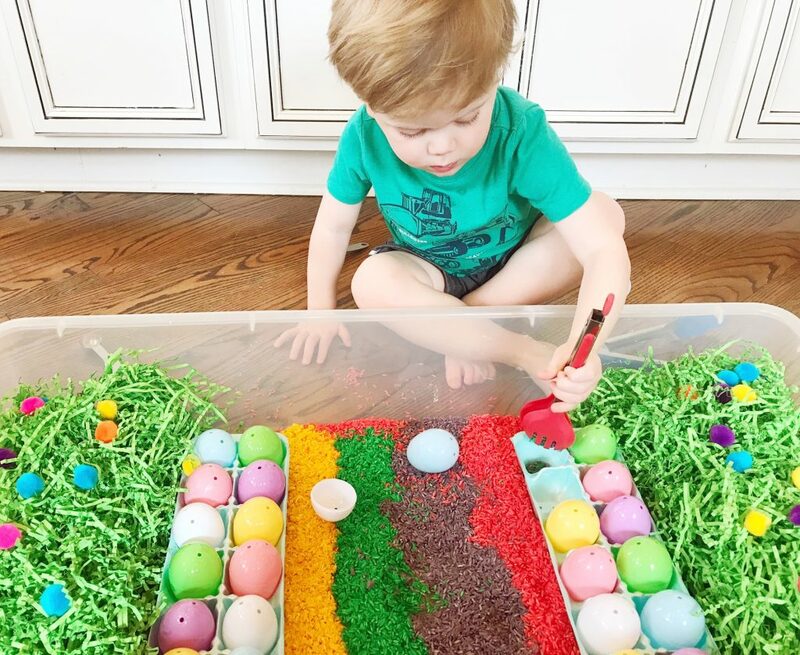 This sensory bin is super easy and will entertain your toddler for at least 15 minutes. That’s pretty good in my book. I’ve experimented with several sensory bins and quickly discovered the beauty of them. They are really easy to do and seem simple but they offer a deep level of educational benefits. I go more into detail about that here. 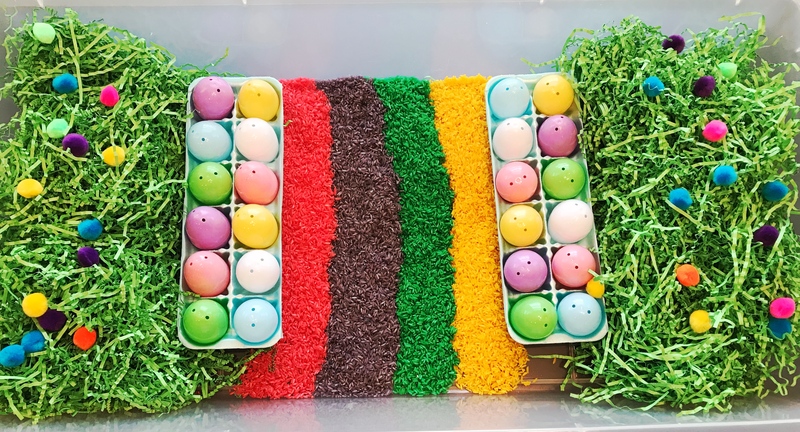 But for today let’s get right into our easy easter sensory bin! This sensory bin was so pretty that I kind of wanted to frame it. The controlling side of me didn’t want me son to mess up the beauty that was my sensory bin. But, alas, toddler fun prevailed and I introduced it to my toddler. And surprisingly he was hesitant to mix the colors but when I assured him that it was okay, he was all in! Let’s get to the knitty gritty of this sensory bin. Honestly you can make this as easy or complicated as you want. I tend to stick with easy! I started by dying my rice. Which is also super easy and I’ll tell you how a little later. Then I put my Easter Grass on both sides of my bins. This was a good way to add a different texture besides just rice. Next, I layered in the rice by color. If you don’t want to do this you can just dump some rice in the bin. After that I added the egg cartons to both sides of the bin and put a dozen plastic eggs on each side. Lastly, I sprinkled in a few pom poms on top of the Easter Grass. It added a pop of color. Plus, I wanted to see what my toddler would do with them. This was absolutely the most exciting part! I was really looking forward to showing my toddler his new sensory bin and his reaction did not disappoint. He was immediately ready to dive in and play. You can be involved as much or as little as you are comfortable with. I like to start by just seeing what he’ll do. I was surprised at how reserved he was. He started by using my tablespoon measuring cups and just digging. Then he moved on to added rice inside the eggs. Next he put rice inside the egg slots of the egg carton. After he was done digging, he picked up the tongs. He used them to pick up eggs and pom poms and then exploration went on from there. If he seemed to be out of ideas I would prompt him with another one. But other than that I pretty much just let him go with it. Again, I cannot stress enough, that I am not crafty. So, I promise this was very easy!! In a container of your choosing (one with a lid) put the rice and add in the vinegar. Then add as much food coloring as you want. Shake the container until the rice is completely covered. Lastly, set it out on a plate or paper towels to dry. There you have it mamas. From my non crafty, busy self to yours. I hope this sensory bin provides a ton of fun for your toddler, a little free time for you to sit down and great memories for you both! I have a 2.5 year old and a 10 month old. I’d love to start sensory bins, but I’m worried about my 10 month old that puts everything in his mouth. Any tips on how to approach this? Hey Iris! Yes, I started sensory bins at about 10 months with my son and they just looked a little different at that time. For this particular sensory bin. I would use more pom poms and eliminate the rice since it’ll be easy for the 10 month old to put in their mouth (doesn’t everything go in their mouth?haha). Then you could just closely monitor the younger child and use this as a teaching opportunity to show them how to use sensory bins. Telling them things don’t go in their mouth and so forth. I think you’ll be surprised at how quickly they listen. You can also use things like oatmeal, cornmeal or balls. Things that are safe to put in your mouth. I hope this help! And thank you so much for checking out my site!